The third feature film from director Mark O’Connor (King of the Travellers, Between the Canals) is to begin principal photography in Dublin on Wednesday 15th of February and will shoot for just under two weeks until the 27th February. 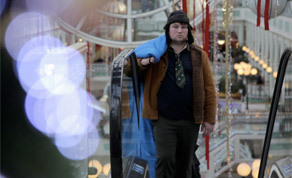 ‘Stalker’ is a dark thriller which is set in Dublin over the Christmas period, it sees a homeless man Oliver Nolan, played by John Connors (King of the Travellers) meet a disaffected teenager called Tommy, played by Barry Keoghan (Between The Canals) who confides in him. Tommy’s mother Theresa, played by Mary Murray (Legends of Valhalla; Thor, Eamon) is a drug addict and she owes money to her brother Rudyard’s drug dealing gang. When Oliver learns about this he starts to stalk Rudyard, played by Peter Coonan (Love/Hate, Between The Canals) with the intention of saving Tommy and his mother. Stephen Cinch (Between The Canals) plays Rudyard’s right hand man ‘Sausages’ and Mick Foran (Between The Canals, King of The Travellers) also stars. The script was penned by director Mark O’Connor and actor John Connors. Executive producers for the film are Cormac Fox (King of the Travellers, I Hate Musicals; The Musical) of Vico Films, Maureen Justice and Helen Armstrong. It will be produced by TJ O Grady Peyton (The Tudors, Stella Days). Fiona Carey (A Fistful of Diamonds) is Art Director on the project. The film will shoot on location in Dublin and Wicklow on Canon 5D Mark 2 and the DOP is Eoin Macken (Charlie Casanova, The Inside). Christian Byrne (King of the Travellers, Treasure Island) is sound mixer on the film. Beatriz Aybar is the Costume Designer with Steve Foot (Strangers in the Night) providing hair and make-up. All stunts for the film are being coordinated by Paul Valentine (Jack Taylor; The Pikeman, Five Minutes to Heaven) and John Sheridan (King of The Travellers, Jump). The film will be edited by Mark O’Connor for six weeks at Stalker Films. This micro budget film is totally financed through online investors on the fundit website. It is hoped the film will be ready in time for submission to the Galway Film Fleadh and from there travel to other festivals internationally. It is also the intention of the production team to distribute the film in cinemas and release it on DVD later this year.